A French-owned supplier of baby changing facilities to Disneyland Paris, other leading attractions and global retailers has engaged UK plastics moulding specialist, Tecni-Form Ltd, to manufacture their latest product. Product designers can rarely recreate, in a single piece, an item that normally comprises dozens of assembled parts. Yet there is a well-established manufacturing process – rotational moulding (rotomoulding) – that can unlock the opportunity to do exactly this. When a supermarket design team approached Tecni-Form with a new checkout concept, the result was an intriguing rotomoulded solution and a genuine advancement for the retail sector. 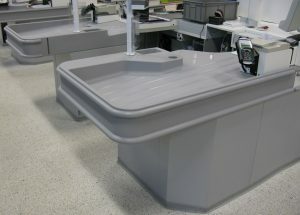 The design challenge centred on the hopper – the final section of a supermarket checkout counter, where scanned items are corralled ready for the shopping bag. Conventional checkout hoppers are constructed in stainless steel and supported underneath by a stand fabricated in steel, or MDF panels.